US cast polymer demand will grow 6.3 percent yearly to 251 million square feet in 2016, driven by a sharp rebound in housing completions from low 2011 levels. Engineered stone will remain the fastest growing type while solid surface will remain the largest segment. Countertops will continue as the dominant application. 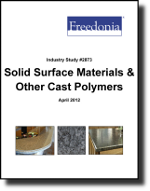 This study analyzes the 184.5 million square foot US cast polymer industry. It presents historical demand data for the years 2001, 2006 and 2011, and forecasts for 2016 and 2021 by material (e.g., marble, resins, alumina trihydrate, quartz), product (e.g., solid surface materials, gel-coated composites, engineered stone), application (e.g., countertops, sink fixtures) and US region. The study also considers market environment factors, details industry structure, evaluates company market share and profiles 40 industry players, including DuPont, Cosentino and Cambria.